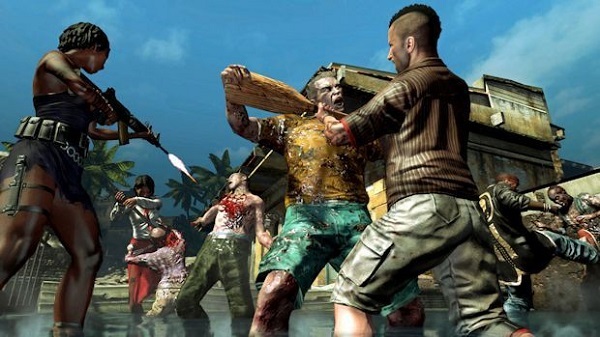 Dead Island was originally released back in 2011 and my experience with the title was a very enjoyable experience full of zombie slaying goodness that was almost devoid of the various issues with bugs that many people had with the title. 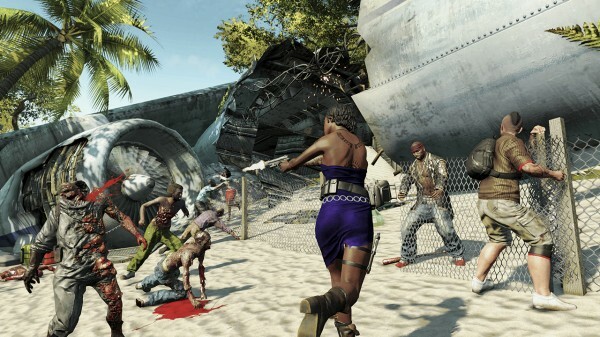 Now two years later Techland and Deep Silver have returned with Dead Island: Riptide, a game which has been emphasized as more of an expansion than a full blown sequel. As a spin-off/expansion, how is Riptide? Let’s find out. 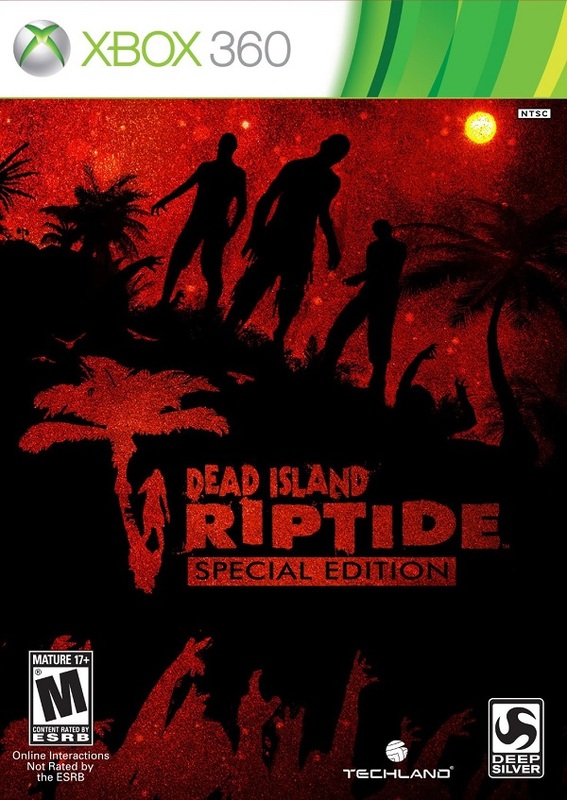 The story of Dead Island: Riptide actually takes place immediately after the events of the original Dead Island. The survivors of the Banoi outbreak managed to escape with their lives and have found what they think is a safe aircraft carrier run by a military organization. However it quickly becomes apparent that something shifty is going on as all of the survivors are imprisoned in the bowels of the ship. Here they meet a new survivor named John who has been held captive for quite some time. After an unknown issue causes a zombie outbreak aboard the ship, causing it to crash, the group of survivors washes up on a new island which is called Palanai. Palanai is suffering from the same zombie crisis that afflicted Banoi, however the stakes are higher than ever now that a surviving member of the military informs the group that a nuclear weapon will be used on Palanai soon and they must hurry to escape the island with their lives. Similar to Dead Island in a number of ways, Dead Island: Riptide is quite sparse on its storytelling. There is certainly a story to be told in the game and the secrets behind the zombie outbreaks are in fact revealed in Riptide, however the storyline is very basic. Even when the game introduces a plot twist involving mutagens, the story is unfortunately very predictable and quite barren. This is perhaps due to the fact that the game’s storyline is told through a series of quests that have to be completed and often these quests simply involve going to a certain area and gathering a missing item, killing a few zombies or simply reaching a specific area. There is a little spice here and there in these mission and two sequences in particular are not only enjoyable but actually create a tense suspenseful atmosphere, but many of them simply devolve into fetch quests. Thanks to the siege system that will be discussed later, players are supposed to take a bit more interest in their fellow survivors and their survival, though ultimately they play such a minimalistic role, or barely any whatsoever, in the storyline it is almost pointless to be concerned for their safety. It is also worth noting that there seem to be a number of plot holes that are left unanswered by the time that Dead Island: Riptide wraps up. This means that while there are a few new developments and twists to the story and the reason for the outbreak is revealed, many will find the story of Riptide lacking. Something must have went wrong when it came to creating Dead Island: Riptide’s environments. While its predecessor that took place on the island of Banoi was a beautiful resort town that starkly contrasted the horrible things players were seeing, Palanoi is quite an ugly place. 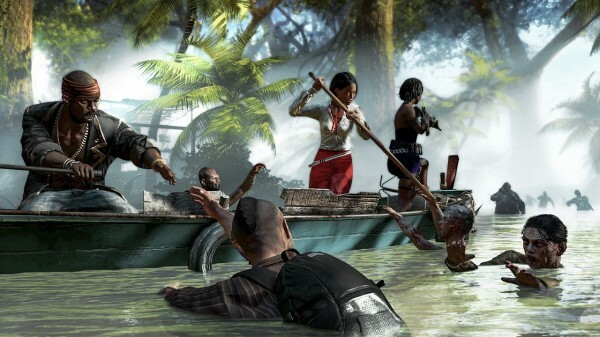 There are only two, though you could stretch things and say two and a half, zones in Dead Island: Riptide and each of them feels bland and unimaginative. The starting area may look decent enough initially, but quickly players will find themselves exploring bland areas that are poorly designed. That says nothing for the amount of building interiors and “Dead Zones” which are duplicated almost to the exact detail numerous times within the game. It is worth noting that the environmental system with the heavy amounts of rain that can fall at times does do wonders for the game’s atmosphere. 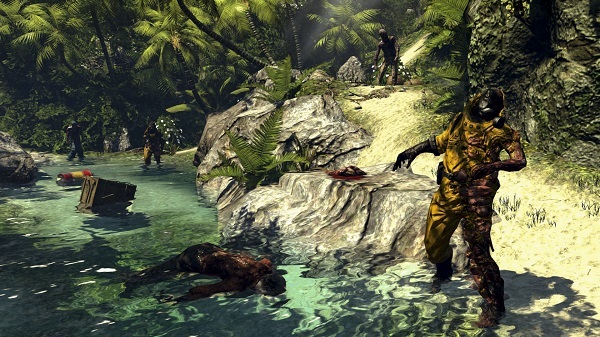 As for the zombies themselves, they appear quite similar to what gamers experienced in the original Dead Island; though their clothing does match the more subdued nature of the island compared the resort that was Banoi. There are a few new enemy types included in this release as well and although they are nothing to really write home about, it is nice to see some more variety to spice things up. It is worth noting that the zombies are also more than willing to part with their limbs similar to the past game. Literally disarming zombies or slicing off their legs or heads remains both visually satisfying and quite visceral as the first person combat and camera pack quite the punch when it comes to combat. Unfortunately I must mention that the game does suffer from quite a bit of slowdown. This primarily occurs whenever the player is fighting in water, though given the flooded nature of Palanoi, there is water everywhere and any combat that takes place in these flooded zones will often slow down to a complete crawl. While Dead Island: Riptide can still be quite the scary experience, the terror aspect of hearing zombies in the distance is practically non-existant in this release. Perhaps it is due to the fact that the ambient noise I enjoyed from the first game has either been removed completely or I failed to notice it at all, but the moans and snarls from the zombies lack the feel that made the first Dead Island an experience to remember. As far as voice work goes, the cast has remained the same for the playable survivors and John’s voicework is commendable, though some of the accents used in the game which seem to still be Australian in nature are forced sounding. One of the first things that players should note when they start up Dead Island: Riptide is that they can import their previous character with all of their levels and skill points. However it is worth noting that thanks to their confinement on the boat, all of their weapons and money has been removed. This means that players start from square one equipment wise if they choose to import their character. Of course starting fresh is always an option, especially for those who want to check out John’s fresh set of skills and focus on hand-to-hand combat. The old survivors have been given a number of new skills as well and with the level cap raised to 70, players still have to be a little choosy when it comes to selecting their skills as there aren’t enough points to go around, but by the time that cap is reached nearly every skill can be leveled up fully. Also added into Riptide is an experience system for the various weapon types: Blunt, Edge, Hand-to-Hand, and Firearms. Using these weapons on zombies raises the level of those weapon types and this adds various bonuses for using weapons of those types, such as more XP, damage or Rage points. While a neat system, the fact that every survivor’s skill tree is designed specifically for a specific weapon type in mind means that while you can certainly work on leveling up your blunt weapon skill, if your character’s entire skill-set adds bonuses to edged weapons, it is rather pointless. Also newly added into the game is the aforementioned siege system. At various points in the story players must defend their base of operations from an incoming horde of zombies. Not only can players die (only to lose money) in these fights, but other survivors can lose their lives if the player isn’t quick to help them. This is because not only will you be fighting in these siege battles, other non-immune survivors and the other playable characters will be CPU controlled to defend the base. Despite there being various quests to give the survivors stronger weapons, even at their strongest the survivors feel very inadequate compared to the player and will almost always need saving of some kind. This means that while you are trying to not only set up fences to hold zombies off, you’ll also be running from place to place to save your hapless allies. Riptide also sees the addition of a boat as a faster way to navigate the flooded island of Palanoi. Traveling through the deep waters of flood zones is extremely tedious without a boat, making aquatic travel a necessity. While driving the boat you can use a boost system to ram through zombies wading through the water, often creating a satisfying visceral collision. However if you aren’t careful, zombies can rip your team members off of the boat or even climb onto the craft and tackle you into the water, forcing you to fight for your life before returning to your dinghy. 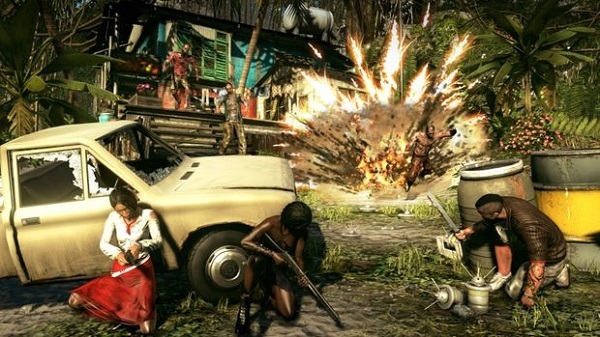 Outside of these additions, Dead Island: Riptide is still very much the same game as Dead Island, players will come across numerous weapons and creating poisonous, electrified or weapons on fire is always a great experience that allows for the game’s satisfying combat system to always be enjoyed. It is worth noting that the hand-to-hand weapons and mines that can be used to help in sieges or normally are really the only actual weapon additions in Riptide while everything else will be extremely similar. The game can still be incredibly difficult at times and thanks to the zombies scaling to your level, there is never a time that you’ll truly feel safe. Even the weakest zombies pose a major threat as they can levy enough damage that simply taking a few hits can put you on the ground. This makes taking out these enemies by slicing their limbs off, throwing weapons at their heads or whatever else you feel like doing all the more satisfying however as the first-person camera really helps sell the experience. It is also worth noting that as mentioned earlier, there are a few new enemy types. These enemies add a bit of a challenge as those familiar with the series will be caught off guard, especially when it comes to special versions of basic zombies appear. The “Grenadier,” “Screamer,” and “Wrestler” special zombies are certainly unique, however they aren’t all that challenging due to their very obvious weaknesses. It is also worth noting that there are special areas called “Dead Zones” where players can challenge an enclosed area full of basic zombies, infected, special versions of infected and “Boss” type enemies which are extremely strong and difficult to kill. These Dead Zones often contain some of the best loot in the game, though these Dead Zones are also some of the most re-used segments in the game. As for the game’s online system, the co-operative mode remains online only as there is no split-screen option however it continues to play flawlessly. 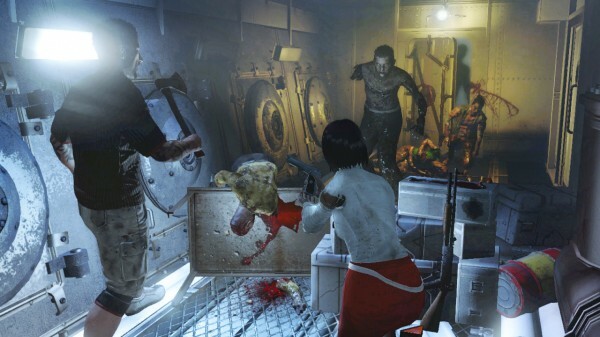 With the game’s drop-in and drop-out online system, players can easily join a team of three other survivors to tackle various missions with four players at a time without a hint of lag, though the frame rate can drop with four players fighting enemies at one time. 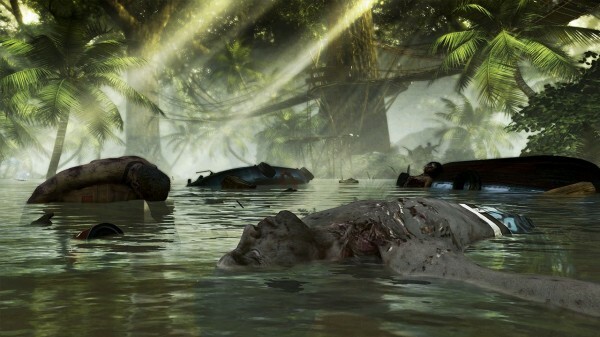 It is worth noting that the bugs that plagued the original Dead Island are still prevalent in Riptide. There are numerous graphical glitches, glitches involving quests either not finishing properly or requiring an incorrect number of items and even a few odd bugs that teleport players to the other side of the map and more. While many of these do not ruin the experience and even the quests can be completed once you gather more than the shown amount, they are quite noticeable. Dead Island: Riptide is without a doubt a very enjoyable game. With the same satisfying combat system and enjoyable weapons of Dead Island, taking on the countless zombies in Palanoi is a blast, especially when you team up with your friends. However even though this release is an expansion, the game’s unimaginative and repetitive environments, bland storyline and blander quest system, issues with slowdown and bugs and a number of new additions that just fail to work well make the experience pale in comparison to the original.